As this is the third trip out for Leroy in his early fly fishing journey, we sit back and watch his dad, Ernie, give instruction. Young Leroy is a quick study. He learns the lob cast and picks up a quick ten in the net. The first day is a short one, as we only have the late afternoon hours after traveling. But, no worries! We all hook up to a few browns and rainbows. A great way to start the trip. I'm a little concerned about Leroy and his laid back approach to catching fish. I mean, RD always gives a hoot and holler everytime a fish hooks up! Lol. But, young Leroy is more on the quiet side and very politely says "fish". Papa Ernie brings over the net to bring in the next fish. This goes on over and over again. Almost 20 fish netted in a couple of hours between the three of us with Ernie getting in a few between saying "mend!" and "set!" to Leroy. A good start. Day one ends with a fine dinner at Blacktail Station in Dillon. 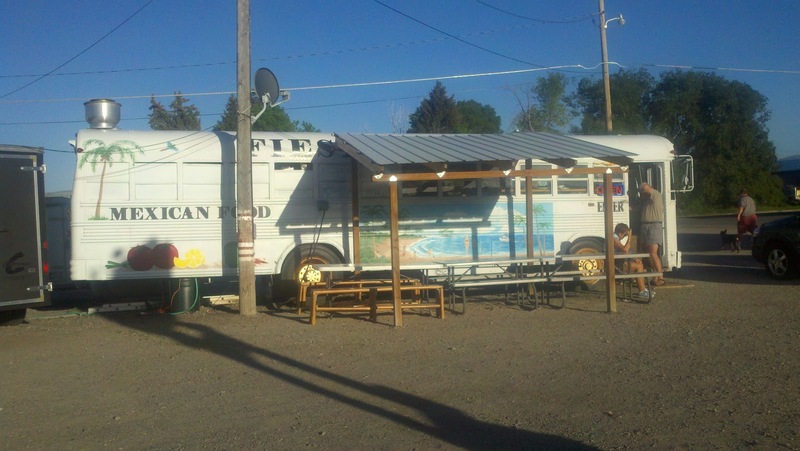 At the end of the day, Maynard and I won out on going to the Taco Bus. Ernie always gets out voted... poor guy. We are all tired at the end of Day 2. And macho burritos and enchiladas de crema are a perfect way to satisfy the hunger pangs. Ernie ended up calling this stretch, "The Nursery". Now, the size of fish in here were a nice 12-14 or 15 inches...which in my opinion is not a baby fish. Oh well. It has its name. "The Nursery" was simply amazing anyway you looked at it. And I did find some very nice fish... I even landed a 5 lb whitefish at the end... #13. Lucky #? Nope. I couldn't get off the number. But, the fly shop told me that it was indeed a "prize" for people up there that smoke them... = ) Maynard had his fair share of fish too that morning. And Ernie who named the water, "The Nursery", must have forgotten about this catch! Maybe the name should refer to how many were in there instead! It was a 20 + catch day for Ernie too. Yep, RD is still smilin'!!! How do you like my "baby"??? I guess that the best thing about this trip was that I only needed two flies. A crane and a midge. I threw them for five days! And they delivered! I've never seen anything like it. I kept smiling even after I lost my net. Two years in a row on the same river. What's up with that? Well, if my net is a sacrifice to the "fishing gods" or a new owner, I can deal with it. Of course, Ernie had a few casts of his own. He landed this little guy. Hey, wasn't that the one that I was after??? A steak dinner was on tap after another epic day of fishing catching. I don't know why being on the river all day makes you sooooo hungry for a salad, baked potato and a hot, juicy steak! But, it does. And no, they couldn't get me to partake of the appetizer of the night...Rocky Mtn. Oysters... heehee. Day 5, The Party's Over... All good things must come to... well, not an end. Just until we meet up again. We had three hours to rock the house. And we did. EPIC trip???? You could say that again. One more time to "Slaugher Alley" was in order. "Incoming" trout for Maynard. He also gave me some very useful tips on casting. And my favorite catch of the EPIC Holiday! After Ernie helped me on my "mending", he took care of business. Ernie's favorite slab to end the the trip... It was time to head home. It just didn't get any better than this. At least 6 double hook-ups during the trip. Well over 100 fish caught, even though we took time out one day to search for the "Holy Grail" on a sight seeing trip. (Won't get into that one...ha) Each of us had a rainbow over 17 inches. And the browns had size, color and gorgeous halos. You just can't ask for more than that. Good bye blueberry pancakes. Good bye cold, crisp 25 degree air! Good bye Beave! Until next time. Nick - Alll I can say is that I've never seem anything like it... Now I'm spoiled. Which isn't a good thing! It's tough that you have to go home to rest after a trip like that. LOL One rarely finds such a place and have such so much luck. Glad it was you that did. Mark ~ I am still exhausted. It was hard to get out of bed the last two days! Haha. But, the trip was totally worth a bit of jetlag...errr...fishlag. Unbelievable!!!! Am I reading the beginning of a book about all your fishing expeditions? This trip would have to be the last chapter, because the rest of the chapters would never surpass this trip; although you may dispute that statement. 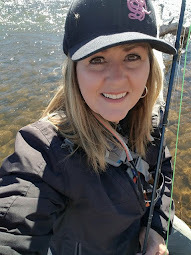 A few questions---size midge, wt rods and length—two fly set-up or one using an indicator or just dead drifting---in weather as cold as that were the gloves waterproof?? Any hatch to speak of or did you guys take the advice of the fly shops as far as flies are concerned. I really enjoyed this post ----thanks for sharing a fantastic trip!! Bill ~ Let's see, where to start! I used a 9ft-5wt and maybe the others did also. Or even a 6wt. Two nymphs for most of us too. A crane size 8-10 and a brown zebra midge size 18. 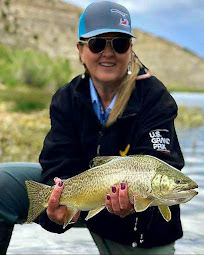 All of my time while living in Eastern Idaho, and, I was all over and around the Beaverhead and never fished it! It is one of my regrets after moving to Northern Colorado. Beautiful post with pictures to back it up. Thanks for taking me along on your trip even if just in writing. Mel ~ Well, darn it! Maybe you will still be able to visit the Beave someday. You do have some beautiful water nearby your new place of residence though! Thanks for stopping by. Looks like you had a great trip Emily! That's pretty country up there and the water is superb. I think it's great that you're out fishing while the rest of us candy-butts are sitting inside watching it snow! 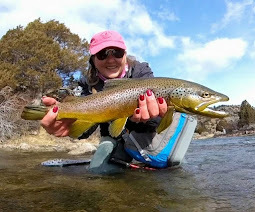 Great photos, story and fish.....not to mention the gorgeous scenery! Very nice! Brian ~ I sort of know now what it feels like to catch bigger fish like you... well, not really. But, it was a thrill to have one after another make me work for it. Thanks for stopping by! All that action and I probably would have made like Leroy and slept in a day myself. Loosk like an amazing trip, friends, fish, food, what else can one possibly ask for? Mike - It was a fly fisher's dream... Now, to catch up on my sleep! Looks like a great trip. I will be puttin "The Beav" on my bucket list! 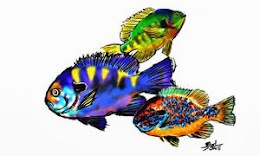 Love those fish! Well you went and done it didn't you. You went out and had an epic fishing trip. Nicely done Em. An EPIC trip doesn't happen everyday... So, you must relish it and hold it dear! But, that won't keep me from trying again soon... ha.